Dan Burn has admitted for the first time he would not have considered leaving Wigan Athletic for any club outside the Premier League. The big centre-back, who is nearing a return to full fitness after breaking his foot in pre-season, signed for Brighton last month, before being loaned back to Wigan until January. And he says it was only the lure of one more crack at the top flight that caused him to sever ties with a club he credits as having kickstarted his career. 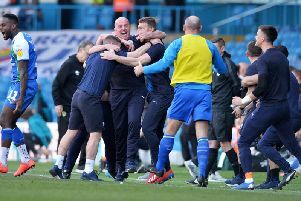 “I think if it had been any other team in the Championship, I probably would have said ‘no’ because I’m so happy here,” Burn told the Wigan Post. “Fair play to the chairman and Gary Caldwell for bringing me here, because there weren’t too many teams interested in me after Fulham released me (in 2016). “For them to take that chance and then stick by me after a bit of a sticky start...I’ll always be grateful – and hopefully I’ve repaid them since. “But this is the Premier League, and I never thought I’d get ever back there. Burn admits his guilt at leaving has been eased by the fine start Latics have made to the season in his absence. And he’s confident Paul Cook’s men have it in them to establish themselves as a Championship outfit. “I knew we wouldn’t struggle this year, because of the quality across the board,” he added. “We’ve also got players not in the team who can come in and make a difference, as they did last week when Vaughany and Cal helped to change the Rotherham game. “That gives the gaffer a headache when everybody’s fit.